The world's most ridiculous agility dog! 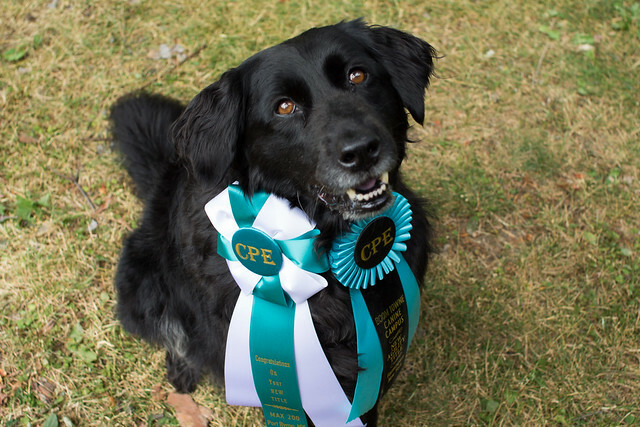 Dahlia and I went to a CPE trial last weekend and had a BLAST. She got two Q's (one in Jackpot and one in Standard) and ended up getting a mini-title because of the Standard Q. We're just Level 1 and so we're just sort of figuring this stuff out. Here's my ridiculously happy monster and her ribbons. Anyway, that's not the ridiculous part. The VIDEO is. My instructor videotaped our Jackpot run. Here's the fun thing about it: (1) I started in a place I totally didn't start in because everyone else did. Oops! (2) So I had NO PLAN on where to go after the first few obstacles. (3) Which meant I had NO IDEA where I needed to throw in a front cross (as we're not up on rears yet). Dahlia had fun even though I looked like a moron! One of these days I swear I'll get a video of a GOOD run! Awww Well done.....she is very cute!!! She is definitely adorable and she has so much fun, even if I have no idea what I'm doing. I love seeing how happy she is to do it! I love Dahlia That is all. Aww thank you! She's a dog people instantly fall in love with. I know I sure did. I met her on a transport and as soon as I saw her I KNEW I had to bring her home. What a great, happy expression! Congrats!